A lot of tourists have heard about the floating markets in Thailand while many of these visitors have arranged a trip to Damnoen Saduak which is referred to as the tourist Mecca. In Bangkok alone and its environs, there at least five floating market sites. Because we wanted a real deal, so we made for Amphawa Floating Market in Samut Songkhram which is just about 90 Km south west of Bangkok, for a weekend on the river. If you look, you can do all this for just a day trip. Amphawa is an afternoon and evening market that is all about fish and seafood. The little market vessels piled high with astonishing looking crabs, prawns and squid wait near the river banks while the street stands sell fish cakes, whole unidentifiable fish-based meals. Majority of the tourists have one or two floating markets on their list of activities when visiting Thailand most importantly Bangkok. 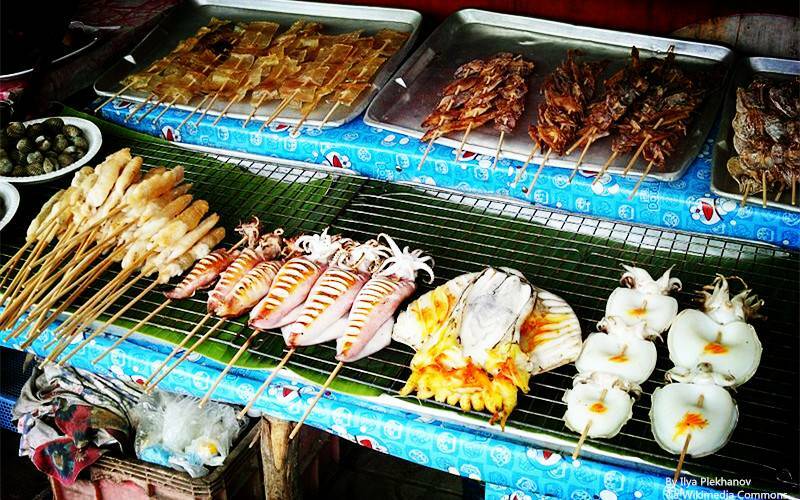 The most renowned floating market of all is the Damnoen Saduk which has been overrun by tourists and scammers as well. But if you want the real floating market action, then you better head to the Amphawa Floating Market. When Is The Best Time To Visit Amphwawa? The floating market is located about 1.5 – 2 hours away from Bangkok. Though technically open all week Amphawa Floating Market comes alive during the weekends when the local Thais from Bangkok come shopping for fresh seafood and other things. We were not disappointed at all when we called the market one Sunday afternoon. Our trip turned out to be a great affordable one which serves an escape route from the crowd in the city. In the evening to be specific, you will enjoy an extraordinary scene of many glow-worms flaming on the trees adjoining the river. There are many things and places to see and do at the Amphawa Floating Market. We also strolled along the waterway where several malls that sell all kinds of stuff like Amphawa souvenirs, food, clothing, and sweets were set up. Although the market is not only limited to canal and springs along the streets around the town; aside shopping, you can also get like services like a classic Thai massage, even on a boat! As you pass through the canal, you will notice a short Thai man asking you if you will like to go on a short trip on a boat and don't hesitate to say capital YES the offer! Why? Because taking a longboat ride is the one of the memorable experience you can ever have in this life! The trip is affordable with just 50 baht per passenger you are ready for about one and half hour experience on Thai waters coupled with a lot of lucky bangs! The boats take you beside the Mae Klong River through several ancient temples popularly called Wats by the Thais. 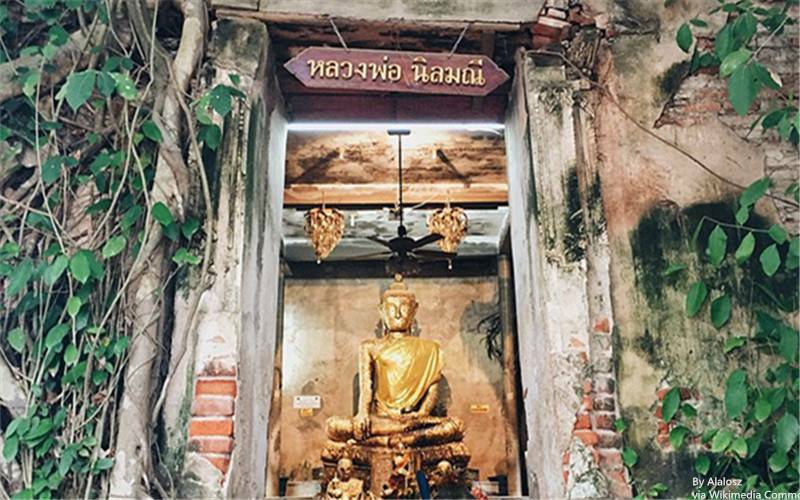 Each stop takes about 15 minutes to allow you look round and give offerings to Buddha while the final stop at a zoo is connected to the famous Wat Bang Kung which is an old temple enclosed in an ancient Banyan tree is the most exciting of all! A lot of people on my boat during the trip didn't proceed beyond this point because of the zoo its a few hundred meters distances from the zoo. Just after the zoo, turn right in continuation of the journey to arrive at a major road. After crossing the road, Wat is directly on the left side of the street. A must see if you ever get there! Many of the natives from Bangkok that venture out to the Amphawa Floating Market are only there to enjoy amazing fresh seafood cuisine! A number of the restaurants along the waterway have tables and chairs on the steps leading to the river without the exception of this one. They are a great place to rest, eat and participate in the lively market around you. But if you are the reserve type that is looking for a restaurant with less noise, one is located just by the right where the canal meets the Mae Klong River with beautiful views of the longboats passing by. If you are interested in Amphawa tour, click to start your own trip. Or if you have any problems you can contact us also. You can decide to buy a return ticket to Bangkok immediately you arrive at Amphawa. All the staff at the minibus station will ask you is the time you will like to return as buses leave every hour, on the hour with the last one going by 21:00 (9:00 PM) daily. To secure your seat, book a ticket ahead! To do this a member of minibus station staff will put down your name and the time to know the member of passengers they will be expecting. If you intend visiting a floating market, the Amphawa Floating Market is the best option for you! This day trip is reasonably affordable, and not at all necessary to book an expedition. Going without a tour will equally afford you an opportunity to explore the market at your speed. Amphawa Tour-Super fund! Super affordable! A great way to enjoy Thai life and culture!